A couple of weeks ago, I went to the McGowan Fine Art Gallery in Concord, NH. A reception was being held for Nancy Simonds, one of the Gallery’s long-standing and most popular artists, in honor of her exhibition there. The above pic does NOT do justice to the vibrance and depth of the color — or the impact the scale of the painting has! And such a unique color combination — a breadth of deep hues serving as a neutral with the joy of the fuchsia and tangerine. A mix of serene and fun, and the shapes are certainly whimsical. I couldn’t help remark to gallery owner Sarah Chaffee that Mardi Gras would be the most amazing launch pad for interior design. I could just see this as a focal point above a sofa in an airy living room, with silvery walls and sofa and drapes, indigo arm chairs, accents of those amazing warms colors — and definitely one piece of vintage brown furniture to pull out those chocolate tones! A living room with style but doesn’t take itself too seriously, much like many of my fellow Gen-Xers (and now Millenials). We started discussing how interior designers begin to develop a design scheme; where does one start and how does art fit in? Designers draw their inspiration for color and pattern combinations from a slew of sources, but there always has to be a starting point. Most often it might be a fabric, textile, or wallpaper that incorporates a number of different colors that will then serve as a color scheme. I love using rugs — vintage, antique, or modern — as a starting point. You can also use an impactful work of art as your starting point, and this may be the most personal way to begin a design scheme. There are few things more personal than the way a particular person reacts to a particular work of art. And as I am all about making your home an extension of your own inner self, beginning with art is my favorite — albeit perhaps the most difficult — route to beginning design. I’ve gathered images of some of my favorite rooms which — to me — look like they have drawn their inspiration from the art they feature. Super classy and interesting room. I love how the patterns play together and yet don’t detract from the painting. That’s because there is lots of room for the eye to rest in between patterns — the ivory walls, beige (but textural) corner sofa and rug. 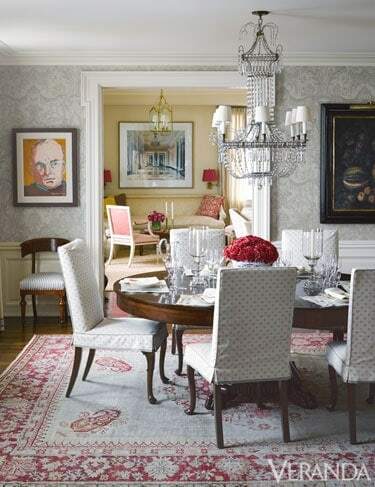 Alessandra Branca shows that modern art and super traditional decor go perfectly together. Do you think these paintings would pop nearly so well against a white wall in the above? I don’t! The yellow is a stroke of genius. It can be found in small proportions in each painting. I need to get me a bull and go riding like an Amazon through my living room. The husband would flip. Again, super traditional, but super rich in color. Notice how the small but vibrant dose of teal in the painting is repeated in the chairs. The sofa and the flowers are in lighter, more subtle versions of the greens and reds in the painting. Varying the values of a color — the lightness and darkness of it — adds depth to a room. Love this rich, camel colored room. It is totally made by the art. See, again, how the chairs (dusty blue) and tablecloth (soft butter) bring out colors found in smaller proportion in the painting rather than the dominant rose color? A very happy, comfy room. Emerald is definitely having a moment, but for us green lovers, it’s always been there. 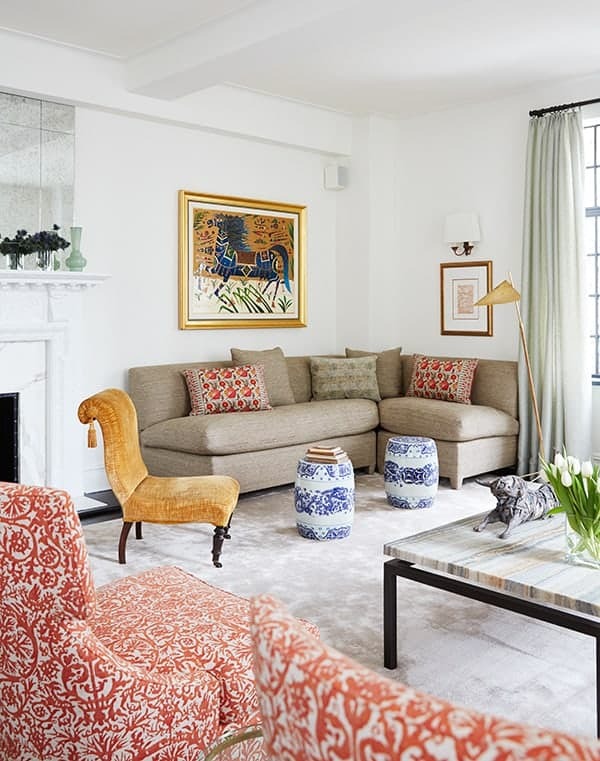 Room furnishing colors are in reverse proportion to the colors in the painting — small doses of emerald (pillows) compared to its being the dominant color in the art, larger doses of buttery yellow (sofas, drapes) compared to its being a secondary color in the art. The smallest bit of purple in the painting is picked up by lavender pillows. This whole project from Jennifer Culp made my jaw drop. The owners are photography collectors and have some very fine paintings the wife’s grandmother painted as well. Culp made a beautiful and eclectic interior that worked hand-in-glove with the art, all the while honoring the bones of the house. Inspired. Neutral backdrop with pops of color pulled from the paintings. Never fails. GORGEOUS painting. Not so sure about the chrome chairs, but I do like the blue with the aubergine, which was drawn from the woman’s coat color and the blue from the evening sky. In all of the above images, I don’t really see any fabric or other textile serving as the nexus of the color scheme — rather, it’s the art. I think you’ll also agree that art doesn’t need to be on a white wall in order to draw your attention and be able to fully appreciate it, or that abstract art only fits with modern decor or that traditional art only works with traditional decor. A little anachronism gives interiors vibration and life! You can buy what speaks to you and not worry about what it goes with; you can plan the decor around the art. No matter how annoyed artists may or may not get by the subject of art-matching-the-sofa, your art will always have greater impact in a home when it is supported by decor. And yes, the art in our example images, probably cost a fortune, but you can buy big, beautiful, impactful pieces if you know where to look. 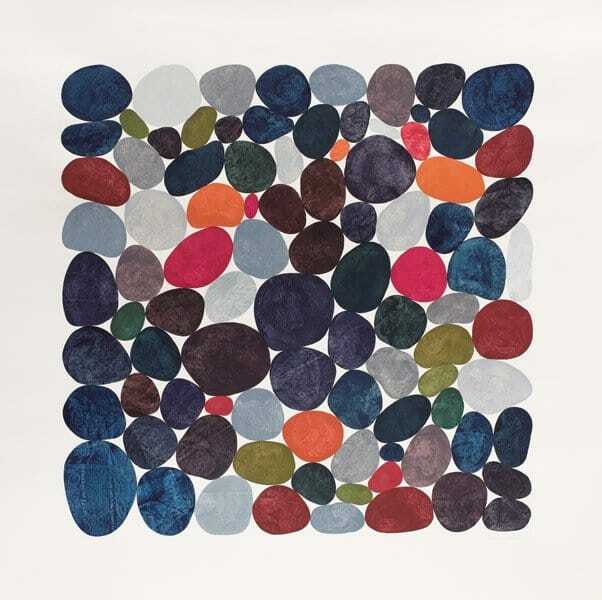 Your best bets for big but budget original art — auctions (see my post about art and auctions here) and Chairish. Some of it is surprisingly good. And if you have the means to support current artists and galleries, do! Keep art alive! Back to our original painting, Nancy Simonds’ Mardi Gras — I couldn’t help but want to come up with a stylish, but not too serious, living room for my hypothetical 30-40 something couple for some grown-up entertaining. 1. Trim for Drapes / 2. / 3. Paint / 4. Sofa Fabric / 5. Sofa / 6. Pillow Fabric / 7. Pillow Fabric / 8. / 9. / 10. / 11. / 12. / 13. Chair Fabric / 14. / 15. Pillow Fabric / 16. / 17. Bench Fabric / 18. I chose to highlight Duralee in this idea board. Duralee has wonderful fabrics, with a number of designer collaborations. Many fabrics are very reasonably priced, and the company has its own line of residential Crypton fabrics. (Believe it or not, you can spill red wine on them and it just beads up, but they are still soft and comfy to touch.) Furthermore, Duralee has its own line of made-in-America upholstery, and sourcing the big items from a single or limited number of vendors saves on freight. Put all these factors together and it makes for some very affordable, very stylish custom furniture. I also couldn’t do a room design without some vintage brown furniture, and this bar cabinet is a stunner!! It is currently at Furniture Consignment in Natick, MA. Who will pick it up? I also had a consignment Hekman wood tray coffee table with curvaceous legs for this board, but I ran out of room. You can find my choice here. Lastly, I’ve balanced the Bungalow 5 end tables with more affordable choices — a rug from Overstock and lamp from Ballard Designs. Art lover? Any piece you scrimped and saved for and want to showcase? Please share — I’d love to see! Next week, outdoor lighting to last a lifetime. Who knew such a thing could be possible? What a fab post and thank you for featuring one of my artists! We will be reposting to our Facebook page this week. Would you consider allowing us to repost it on our blog? I would have an intro that recognizes you as a guest blogger with links back to your blog.